Since the race start was 8 AM, I was able to conduct my pre-race routine pretty leisurely…coffee, bagel thin, bathroom and outfit change (from PJs to my running gear, of course). I woke hubs up a little after 6:30 AM, as we wanted to be on the road right around 7, since we didn’t pick up our packets the day before. We got to the start (Meriwether Lewis Elementary School) a little earlier than predicted (it’s so nice when there’s no traffic) and so we had a lot of time to put on our bibs and store our stuff back in the car. Before lining up, we hit the restrooms one more time (yay real bathrooms) and after a little confusion (the race was supposed to start at 8 sharp) we were OFF! Hubs and I stayed together for like 30 seconds before the massive influx of people (there were 467 runners) just took over. I tried to go out as easy as possible and not weave (to conserve energy) but it was a bit challenging! Still, I was feeling pretty good, trying to get into a groove – my one goal was to match (or beat) my standing PR from 2010 of 49 minutes, though I wasn’t sweating it too hard because I knew this course was hilly. The first portion of the race was a right turn onto a country road, about 1 mile out and back, before headed the opposite direction for a 2 mile out and back. The temperature was NEAR PERFECT – about 60 degrees! The first leg of the race was pretty shady too, which was nice. I was coasting along at around 7:50 pace. It felt comfortable – not easy, but definitely not all-out. The crowd narrowed down a little after Mile 3 (which is also when this song popped on to my playlist, whoo!) and I even passed a few people at that point. Thank goodness for that song, because around that point, the straightaway portion of the course was completely in the sun, which had seemingly appeared out of nowhere! So glad I wore a hat! The hills weren’t stressing me out, because I was practicing (and seemingly rocking) my Perception of Effort on them, but aiiiyyyeee the sun! I couldn’t wait to get in the shade again! 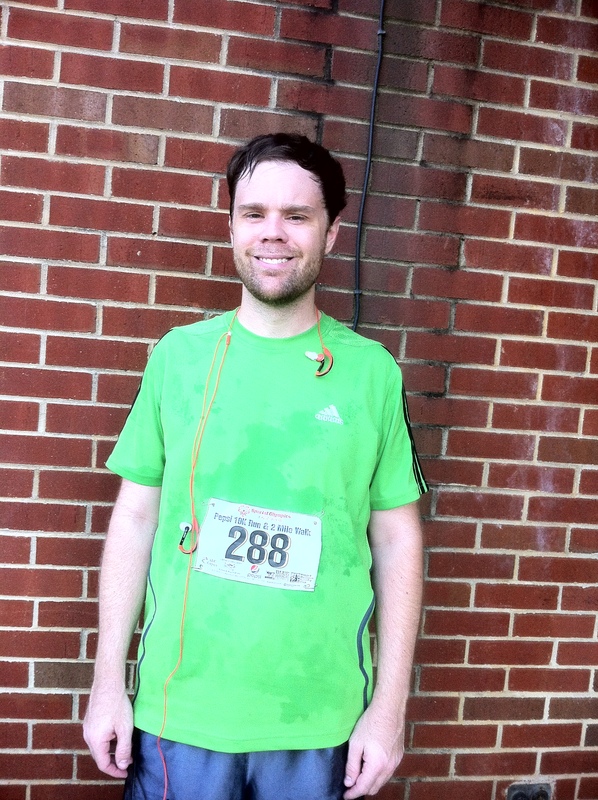 Before I knew it, I clocked in Mile 5 at the fastest pace of the race (7:35). My head was a little achy – but the thankfully, my playlist came to the rescue once again, this time with Gymclass Heroes’ The Fighter. Nice! That mile zoomed by, and before I knew it, I was done! 48:01(7:45 pace) – a 59 second PR for me! After going through the chute and turning in my tag (they use the tag to compile results, the race is not chip-timed) I grabbed a Gatorade (yay for having Pepsi as a sponsor!) and headed back to the finish area to cheer and look for hubby. I ran into Leah (faster twin of Twins Run) and chatted for a moment. The clock was around 55, then 1 hr, then 1 hr 10 min…so I was wondering where hubby could be! I was getting a little worried that he had injured himself or something, when I turned back and saw him by the place we decided to meet if we couldn’t find each other!! I had missed him! I ran over and asked how he did, and get this, it was his FIRST RACE and he finished in 57:16 (9:15 pace)!! I was so proud of him!! Hubby, post race, looking great!! We then headed over to get a few post-race snacks; me, a donut (as pictured at the top of the post – OMG it tasted so good – can’t remember the last time I have had a donut) and hubs a bagel. We stuck around for the raffle and the age group awards and though neither of us placed (I finished 8/49 in my AG, 141 overall; hubs 21/27 in his AG, 308 overall) we DID take home some great prizes: $5 gift card to a local ice cream place, and a free night stay at a local Marriott! Since a lot of people had already gone home, we also were invited to take some of the donated food home – so I brought back a bag of oranges and a bag of Nature’s Path granola bars! Overall, it was an awesome morning and I couldn’t have asked for a better experience! This race also reminded me that you can really accomplish whatever you put your mind to – so I look forward to my marathon training with even more excitement now! Thanks, Jen! We had a blast!! Great job to both of you! That’s such an impressive time for a first road race! Nice work Krissy! Congrats to you and your hubs! Thanks so much, Carly! It was an awesome Saturday! so glad you could enjoy the race with your hubby! what a fun time! also, i love the donut post race! LOL! spa love to you! Thanks, Jenna! Sweating pink for sure 😀 And yes, the donut was wonderful!! Nice work! You smoked that course! Great job Krissy! Congratulations! What a fantastic time and in the heat and hills, so great. Your husband did fantastic as well! That is an impressive time for anyone, but his first time so cool! Thanks so much, Lisa! I cannot wait for our next race!! Wow girl amazing time! You are so fast! Also, so glad that your hubby ran it with you. Oh, and please don’t open blogs with donut pictures. I am now drooling. Congrats. Way to put a smack-down on that PR! Congrats on your new pr– great race! And congrats to your husband, too! Congrats to both you and your husband on a great race!! I love post race donuts!! Yum!! Thanks, Emily! 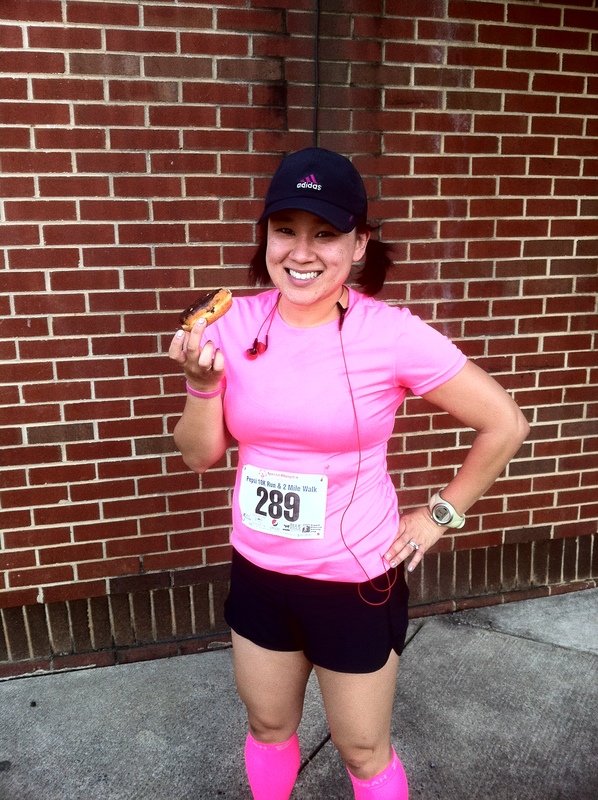 Donuts definitely are rockin’ ways to end a race! Congrats on your PR, and congrats to your husband on doing so well for his first race! I hope I can run that fast soon, haha.